Manchester United have gone 1-0 up thanks to a delightful goal from Marcus Rashford, set up by Paul Pogba. 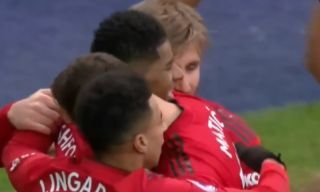 These two are in simply devastating form right now, looking a real partnership at last at Old Trafford since Ole Gunnar Solskjaer gave them the license to play the kind of football that just didn’t seem possible under Jose Mourinho. This lovely strike was similar to the one also worked between these two away to Tottenham, and today it gives them a 1-0 lead against Leicester City at the King Power Stadium.